You also have a view of the mountains on opposite side! 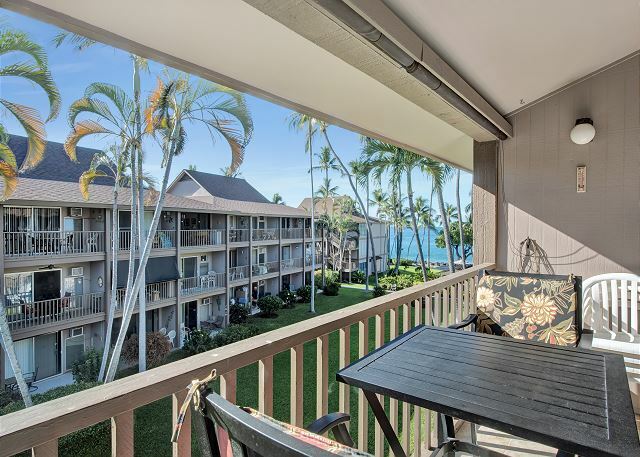 B31 at the Kona Isle is an amazing top floor condo in building B at the Kona Isle. Comfortable Queen Sized bed, and pull out sofa that can sleep 2! Comfortably sleep 4 in the property. Being on the top floor gives you a beautiful view of the grounds. Fully Equipped Kitchen, and AC unit for your comfort! Kona Isle Condos are located on the Kona Coast of the Big Island of Hawaii, and are individually and privately owned. The gorgeous 74-unit complex is meticulously maintained and blissfully tranquil. While staying at Kona Isle you can swim, relax by the pool, or watch the whales and dolphins passing by as you listen to the soothing sounds of the ocean's surf. Treat your eyes to the breathtaking views from anywhere on site, or enjoy peace and quiet, and great sunsets while barbecuing on the BBQ's overlooking the Pacific Ocean. Wireless is available in our Library, as well as many books to read. Kona Isle is located 1 mile from Kailua town and close to shops, seaside restaurants, nightlife and beaches. Great condo for the price! It was clean and had everything we needed. Nice clean ocean front grounds and bbq area with pool. All rental info and management were easy to get A hold of and helpful. Great location near shopping and beaches. Assigned parking space a plus! Keyless door entry was nice as there were no keys to keep track of while on outings or at the beach (wish my rental car was also keyless). This condo saved us enough money on our trip that we were able to take a helicopter tour over the active lava flow! We had a awesome time while there. The accommodations were perfect. We had a wonderful stay the location was perfect, we even had some nice neighbors. The Manager there was very nice and helpful! Our only complaint was that the washer did not work. This vacation rental was great for the price. Was clean, but could use some updating. Initially, I was confused with the doorknob lock system and the key box. Also, there was only one window air conditioner, which needed to have operating directions written out. We spent the first night without because we thought it was broken!This condo is on the 3rd floor and there is no elevator or ramp to bring your belongings to. Was a struggle getting heavy luggage up those stairs. The man made "beach area" was sufficient to catch a few morning rays, but you definitely cannot swim here! The pool was great and beautifully maintained. The views are just gorgeous. ..the flowering shrubs, the beautiful greenery against the pool and ocean are spectacular! the ocean waves crashing on the rocks at night was so serene. Great sounds to fall asleep to. This condo is just a short walk from downtown Kona , which made our stay even more pleasant! Unit needs updating but it was CLEAN. Bed was comfortable, convenient location, quiet complex and helpful management. Best place in Kona to sit on the beach under the palm trees and read a book. Had a wonderful time! There wasn't a coffee bean grinder, which was advertised. As I have been in this unit before, enjoy the simple goodness of this location. Other than having a phone with out service it was a good time. The lanai carpet is worn which is in need of replacement. I miss that bed already. We enfoyed our time there and will be returning next year.